I haven’t done much in the way of painting lately due to my impending thesis deadline (coming up in less than a month now!). I’ve hunkered down to write and have essentially become a “thesis hermit.” My hermitage is my dorm room, where I’ve shelved the 200 books I pilfered from Widener Library. 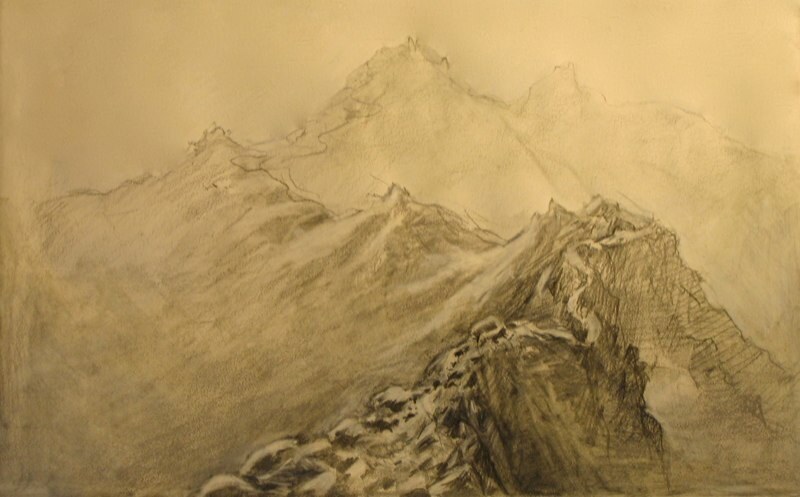 I woke up at 3am, keyed up from a combination of imagined mountaineering and real caffeine, and knew I had to commit the image of the mountain ridge to paper lest I forget it by morning. And so out came the pencils—and here is the result.